Annie Winneg as Eurydice and Greg Nussen as Orpheus play the doomed young lovers who believe that love is all they need. Although they do truly care for each other, they have difficulty communicating with each other or having any level of depth to their relationship, which leads to Eurydice’s struggle between her love for her husband and her love for her father. Winneg’s intelligent, strong, and curious Eurydice feels this emptiness from her life and follows the “Nasty Interesting Man” (played by Adam Lauver) to his apartment to get a letter that her father sent to her from the underworld. Like the original myth, Eurydice falls from her innocence and dies–although instead of being bitten by a snake, she is pushed off of a building. Annie Winneg moves the different stages of Eurydice’s life and death as a new person at each stage; from searching for identity, to searching for memory, to searching for forgetfulness, Winneg demonstrates the affects of love and loss. Adam Lauver as the “Nasty Interesting Man” and Lord of thee Underworld creates a creepy, childlike antagonist to the lovers. His seeming guilelessness makes his sinister overtures towards Eurydice even more repulsive. Lauver’s performance fully encompasses evil and makes the audience cringe whenever he is near. Eurydice’s father played by Cliff Blake provides the most genuine and pure form of love for Eurydice. His gentle presence simply lives (in death) for his daughter’s happiness–even when it means that he will lose her a second time. Blake’s performance is reminiscent of the television fathers of the fifties; one can’t help but want him to be there to support and comfort Eurydice through all of her trials. Lindsay Eagle’s poetic staging matches the lyrical style of Ruhl’s script. 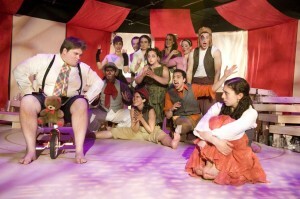 The circus performance creates a logical progression of the surrealistic narrative of the play. Abigail Neuhoff’s set provides a wondrous sandbox for Eagle and the actors to play and create a charged atmosphere of emotion and pathos. The Independent Drama Society’s production of Eurydice provides a harmonious mixture of text and action. The formidable performances of the amateur cast create an atmosphere of wonder and prove that a new generation of professional actors are on the rise. This exciting production conjures up magical images that haunt the audience as they leave. TNETG. 4/22/11. This entry was posted in Drama and tagged 2011, Abigail Neuhoff, Adam Lauver, Annie Winneg, April, BCA Black Box, Boston, chorus of stones, Cliff Blake, clowning, comedic, Drama, Eurydice, Greek Myth, Greg Nussen, Lindsay Eagle, MA, magical, Orpheus and Eurydice, Ovid, Sarah Ruhl, The Independent Drama Society, tragedy by beccackidwell. Bookmark the permalink.